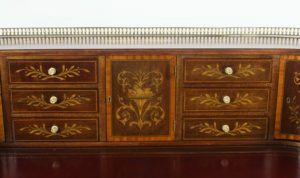 We take huge pleasure in presenting this beautiful mahogany, satinwood and marquetry antique Carlton House desk by the renowned London retailer and cabinet maker Druce & Co, dating from around 1880. The top of this antique Carlton House desk is surmounted with a decorative brass gallery and it is inlaid with a stunning marquetry of baskets of flowers, swags and swirls, a musical trophy and scrolling foliage. The decoration extends right around to the back of the piece, which features classical urns and a prominent scallop shell. Matching functionality with elegance, this antique Carlton House desk has plenty of storage compartments to accommodate all of your stationery. In addition to the eight smaller drawers and five cupboards on top of the desk, there are five larger drawers below. To complete the piece, the top has been expertly relined with a fine quality gilt-tooled oxblood leather inset sliding writing surface. The central drawer bears the embossed brass trade label of Druce & Co. This antique Carlton House desk stands on four elegant tapering legs that terminate in their original brass castors. Its authenticity is unimpeachable; all the locks, handles, keys and castors are present and original. 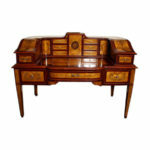 Better still, the desk is finished all around, so it can be displayed in pride of place anywhere in your home. This astonishing piece, redolent with history, is as useful as it is beautiful and is sure to prove the centrepiece of your collection, attracting admiring looks wherever it is displayed. 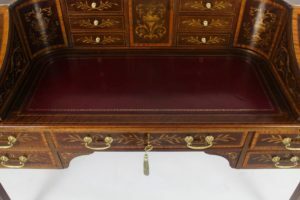 This antique Carlton House desk is in an exceptional condition having been wonderfully cleaned and polished and the leather relined on our workshops as can easily be seen in the photos we have included in our picture set. Kindly take a few seconds to have a look at them and assure yourself of this. We’re confident you will agree it’s a great idea to look at precious pieces like this antique Carlton House desk face-to-face before buying. 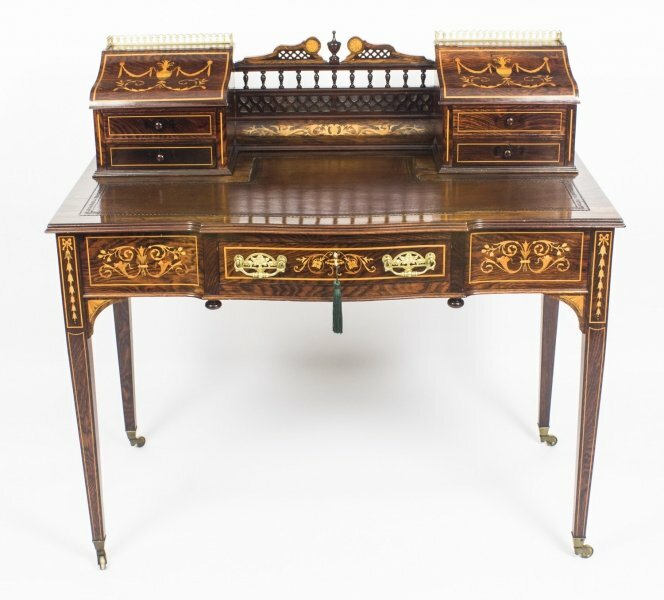 Bearing this in mind, we are really delighted to encourage people to come to our North London showroom to look at this attractive antique Carlton House desk personally. Whilst you are here you can have a peek at our extended range of other amazing objects and also speak about any considerations or topics that you’re faced with. 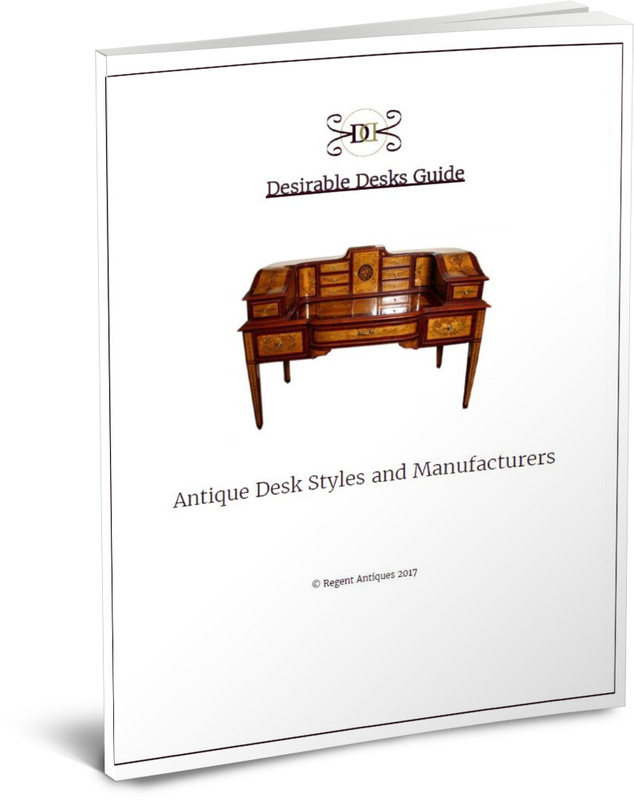 Our internal experts are available to you to respond to queries, not just about this antique Carlton House desk but also concerning antiques and collectibles more generally. The company has a tremendous amount of experience and are always happy to advise. Please click on the ‘Find Out More’ button to get our contact details. Please ring ahead of time to get an appointment so that we can be sure we have the right consultant around to support you. We occasionally open on Saturdays, so if you’d like to come at a weekend, please get in touch in advance to make sure we will be open. We would not want you making a pointless journey. When contacting us please make certain you’ve got the item reference number to hand (09005)so we can make sure which precise item you intend to speak about. 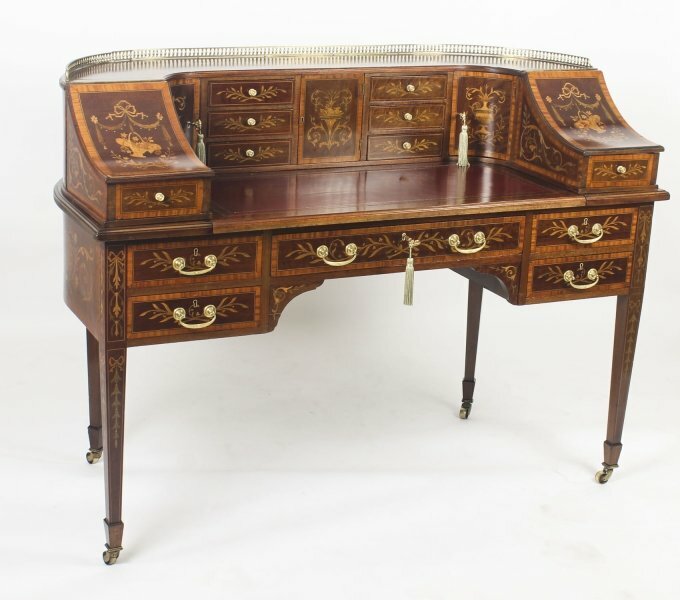 Our London salesroom is open Mon to Fri 10am – 5pm for you to see this antique Carlton House desk. We also open sometimes on Saturdays – but please ring ahead of time before doing the journey on a Saturday as we really do not want you to find nobody here. 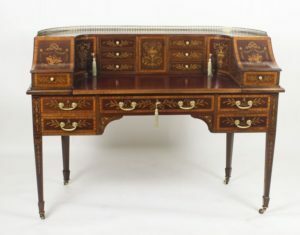 If you are unable to travel to us, then we are always glad to help answer any questions you might have about this antique Carlton House desk by email or telephone. We have in-house consultants who will be happy to support you with any aspect of your proposed purchase, so why not take the opportunity to gather more information. When you make contact please don’t forget to give the item reference number so we know which of our numerous articles you are referring to. You will find both our email address and our telephone number on this page. 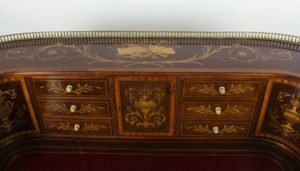 Fine objects such as this antique Carlton House desk need expert packing and transportation to ensure they reach you in the exact same condition that they left us. We take great pride in our shipping experience and can deliver to pretty much any destination worldwide. However, we ask you to get in touch to review transport arrangements and get an estimate prior to making any acquisitions, as we need to be positive that we can fulfill all your shipping expectations. As you will appreciate, some articles have to have delicate handling and we need to see to it that everything is in position to get it to you safely. Please quote the item reference number for this antique Carlton House desk when getting in contact so we know exactly what the shipping needs will involve. 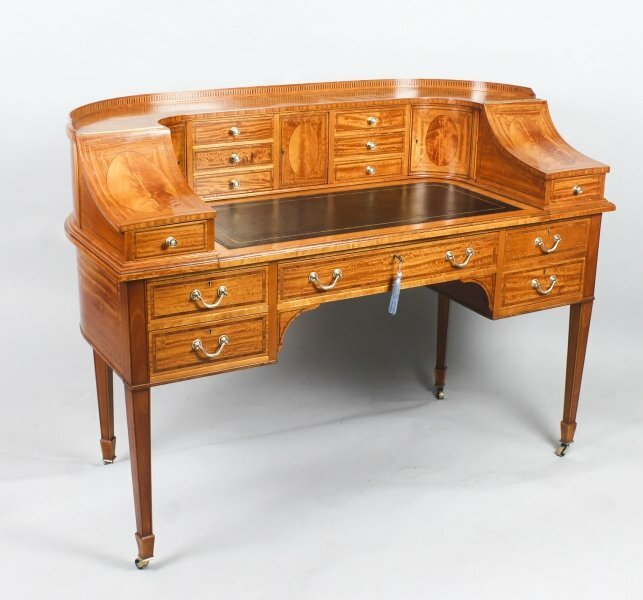 If you are not pleased with this antique Carlton House desk, we offer a 14 day money-back guarantee in conformance with the Distance Selling Regulations. If you do choose to return it, you will need to pay the return shipping charges, unless we sent you an item materially different to what you were expecting or have mis-described it in some material way. You must send the item back in its’ original condition and packaging. You’re also accountable for any customs duties, taxes or fees that become due outside the European Union.